Mirror tests at the beginning of the night, and then, humidity forced us to stay closed. Some technical tests on the primary mirror segments at the beginning of the night. Then, humidity forced us to stay closed. A mixed night with highly variable humidity, seeing and two power cuts. Heavy clouds tonight. No observations taken. Entire night lost to high humidity and thick clouds. + an RV std, before closing due to high humidity around midnight. Telescope offline pending tracker repair. Engineering night with tracker offline. Took HRS calibration data. Telescope offline for engineering week. No observations tonight. Telescope offline due to engineering week. No observations tonight. => Tracker is off tonight. No observations. => Stable night with moderate seeing and low humidity. => Have some technical issues. The following is a guest post by Justyna Modzelewska from CAMK. Along with her collaborators, they have been using SALT to monitor the variability of high redshift quasars with the goal of eventually using these objets to help study Dark Energy. The full paper can be found here. We are currently monitor three quasars over very long timescales with the goal to determine the Dark Energy content of the Universe, but each of the spectra collected by SALT bring something unexpected. 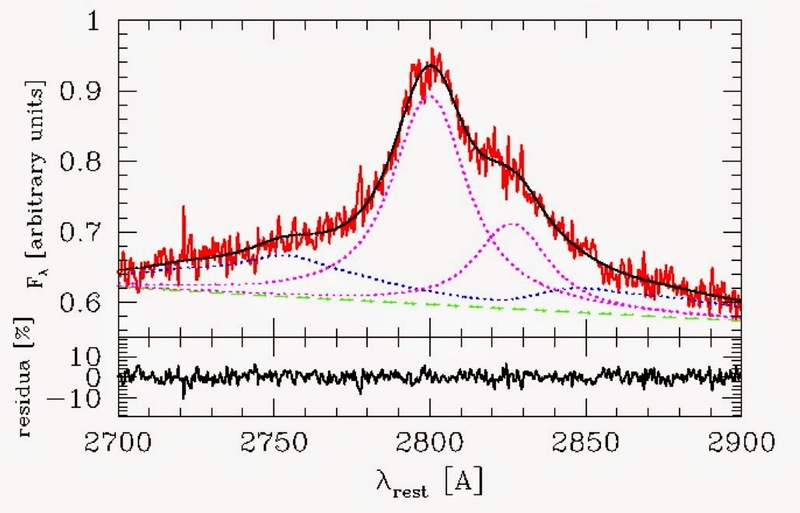 Five observations, which cover the wavelength range 5040-5720 Å , have been made of the quasar CTS C30.10 to sample the MgII line (rest frame 2800 Å), one of the strongest lines in all quasars. The high quality spectrum, usually not available for distant quasars, allowed us to make a unique decomposition of the spectrum. Our purpose is to determine the equivalent width of the Mg II line as accurately as possible. For that, we carefully decompose the spectrum into the Fe II pseudo-continuum, power law, and the line itself. We consider 16 different templates of FeII pseudo-continuum (both observational and theoretical) and two types of functions for the line (Gaussian and Lorentzian). As compared to our previous observations of LBQS 2113-4538 (Hryniewicz, K., et al. 2014), the observed Mg II line in CTS C30.10 has a more complicated structure than we expected. In type A quasars (e.g. LBQS), we see a single component; but for type B quasars (CTS), a second component appears, kinematically (red)shifted by 2700 km/s with respect to the first one. However, our results show the existence of only one component of FeII, and, what is surprising, it is associated with the first component of MgII. The second kinematic component of the Mg II does not have the corresponding Fe II absorption. We still need to explain that theoretically. High quality data from SALT give us an opportunity to see the structure of the line that no one else could observe before, and this will shed light on the structure of quasars. Figure 1: The best fit and residual for 3rd observation for the two kinematic components in emission of the Mg II line (dotted lines mark) and FeII theoretical template [Bruhweiler & Verner (2008),d12-m20-20-5] which is bonded to the first MgII component from the left; continuous lines show the model and the data, dashed lines give the underlying power law. => Stable night with very low humidity and good seeing. Others: Paul at the beginning. Francois by phone. => Stable night with moderate seeing. => Had some technical issues most of the time. => Stable night with good seeing at the beginning and moderate during secong half. Have technical issues during second half of the night. => No science observations tonight. - did SAMS testing at the start of the evening, which got cut short due to high humidity. - did no science observations tonight.